Silchar, April 11: Reiterating his government's commitment to pass the Citizenship (Amendment) Bill, Prime Minister Narendra Modi on Thursday said that Centre will make some amendments to ensure that its implementation does not affect anyone. Modi made the remark while addressing a public rally at Silchar in Assam's Barak Valley, which is going to the polls in the second phase on April 18. "We are committed to bring back the Citizenship (Amendment) Bill. However, we are going to make some amendments in the Bill to ensure that there is no injustice done to anyone," he said, adding that everyone will be taken into confidence while bringing in the changes. The Prime Minister said that minorities in Pakistan and Bangladesh who had had been undergoing religious persecution in those countries had turned foreigners in their own homeland due to the mistake of the Congress. PM Narendra Modi Pitches For Citizenship Bill in West Bengal, Says 'Mamata Banerjee Scared of BJP'. "In 1947, the country was divided on religious lines due to the Congress leadership. The Congress leaders then never thought about Indians who were left out in Pakistan as minorities. Most people who go to temples and gurudwaras have been subjected to torture there," he said. 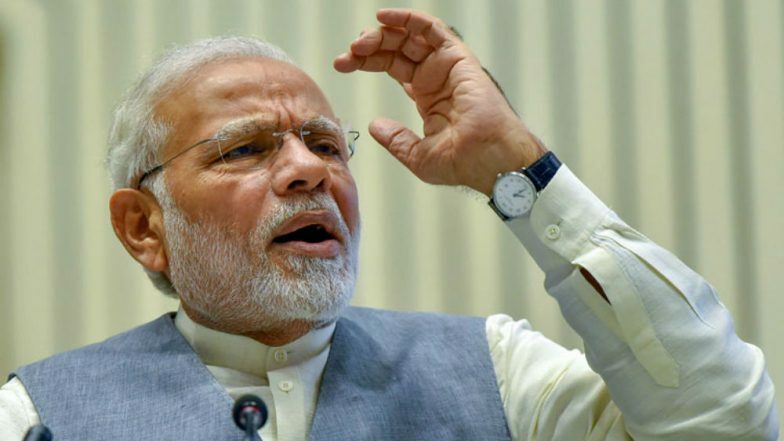 Modi said his government was equally committed to passing the Triple Talaq Bill and added that the 'mahamilavat gathbandhan' of the Congress, All India United Democratic Front (AIUDF) and others cannot stop the "daughters of the country" from getting justice. Regarding the Lok Sabha polls, the Prime Minister said the BJP and its allies were likely to secure all the five constituencies of Assam that went to polls on Thursday.